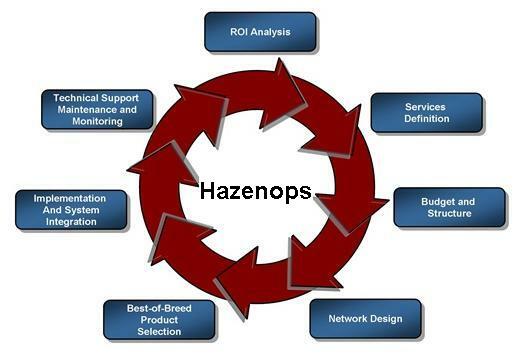 Hazenops Solutions is one of the leading network services company in the United States, South America, Africa and Middle East region, providing advanced network and telecom consulting services and solutions to Telecom Service Providers throughout the region. Hazenops has been involved in the design and implementation of voice, data, IPoDWDM, telecom, mobile and 3G Networks. Hazenops has its headquarters in Texas and offices in Silicon Valley California. The management and engineering team at Hazenops comprizes of the best talent and experience from the carrier and Equipment manufacturer space and is best positioned to handle the challenges given to it by its customers. Hazenops works on Internet exchange point.An Internet exchange point (IX or IXP) is a physical infrastructure through which Internet service providers (ISPs) and Content Delivery Networks (CDNs) exchange Internet traffic between their networks (autonomous systems). IXPs reduce the portion of an ISP's traffic which must be delivered via their upstream transit providers, thereby reducing the average per-bit delivery cost of their service. Furthermore, the increased number of paths available through the IXP improves routing efficiency and fault-tolerance. In addition to that, IXPs exhibit the characteristics of what economists call the network effect.